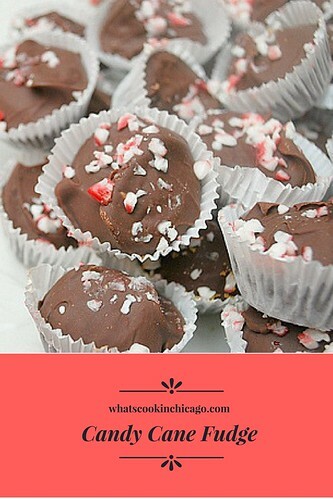 Fudge is one of those candies that are popular to make during the holidays for gifts. This year, I made quite a few food gifts for special family and friends. One of the goodies I included in my packages was this Candy Cane Fudge. This recipe was easily prepared over the stovetop with a few ingredients and the crushed peppermint candy canes added a nice festive touch! While most recipes call for preparing fudge in a large pan, I chose to make individual bites with my mini muffin pan. It couldn't have been any easier to make. Simply melt bittersweet chocolate chips, butter, vanilla and peppermint extracts and some salt. Once it's all melted and smooth, I used a medium scoop to portion out the fudge in a lined mini muffin pan. 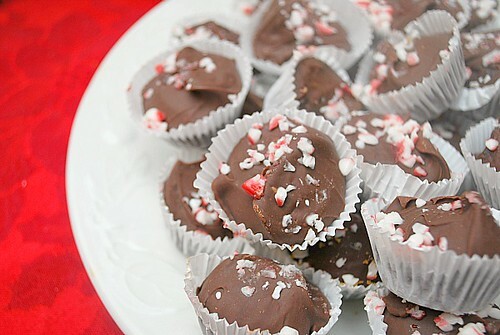 A sprinkling of crushed candy canes garnishes the fudge and the pan is then chilled until the fudge is set. That's all there is to it! Line a mini muffin pan with liners and set aside. In a small saucepan, combine the chocolate chips and condensed milk. Cook over low heat, stirring often, until chocolate has melted and the mixture is smooth. Add the butter, vanilla extract, peppermint extract and salt, and stir until the butter has melted. Using a mini scoop, place a scoop of the fudge mixture into each mined mini muffin well and sprinkle with the candy canes, gently pressing them into top of fudge. Refrigerate until firm, about 3 hours and up to 2 weeks.